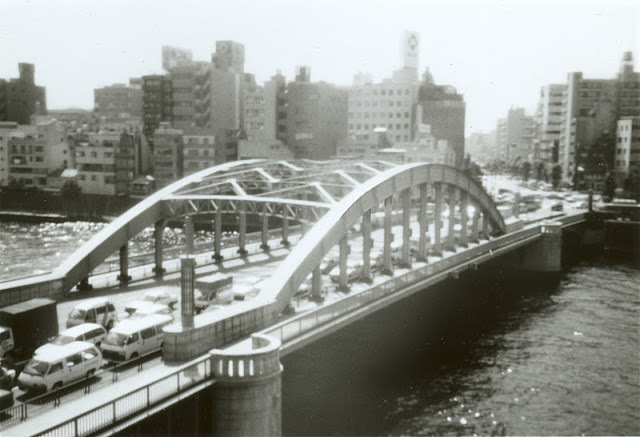 This overexposed photo is of the Komagata-bashi or Komagata Bridge across the Sumida River. It was named after the nearby Matsugata Buddhist Temple which is dedicated to the Bato-Kanon (the horse-headed Buddha). The bridge was built in 1927, four years after the Great Kanto Earthquake destroyed much of Tokyo. It is a three-span bridge, with a through-arch as the center span. It is a couple bridges downstream from the Sakura (or cherry blossom) bridge we studied yesterday. Like the Thames and the Seine, the Sumida River and its bridges has been a source of inspiration for Japanese artists such as Hiroshige and Hokusai. Today, one has to travel to one of Tokyo's less urbanized rivers like the Arakawa to get that same sense of peace and pleasure that was depicted in their prints. Tokyo's River Crossings: Komagata Bridge across the Sumida River (1) by Mark Yashinsky is licensed under a Creative Commons Attribution-NonCommercial-ShareAlike 3.0 United States License.